‘The Life of the Poet’ by Jean Arasanayagam is the winner of the Gratiaen Prize 2017, for the best work of creative writing in English by a Sri Lankan writer living in Sri Lanka. Arasanayagam’s writing was commended by the judges for its erudition and sophistication and for its ability to explore and exploit her own personal experiences as a poet to reflect on the life and view the world as a poet more generally. While the collection is deeply personal it maintains a fine balance between the personal and the general and speaks to themes that resonate with society and life at large. Jean Arasanayagam is one of Sri Lanka’s most prolific and foremost writers. She has been international writer at the Rockefeller centre Bellagio, international writer in Iowa and writer-in-residence in the South West U.K. and Exeter. She received a Doctor of Letters awarded by Bowdoin College Maine and the Premchand award, awarded by the Sahitya Akademi, India. Jean is the recipient of many State Literary awards and the Lifetime Achievement Award, Sahitya Rathana. The judges for the Gratiaen Prize 2017 were: Prof. Carmen Wickramagamage, Professor in English at the University of Peradeniya (chair); Andrew Fowler-Watt, Principal of Trinity College Kandy and highly experienced educationist; and Michelle de Kretser, renowned Australian author of Sri Lankan origin. The Gratiaen Prize 2017 marks the 25th anniversary of the prize and is the only Sri Lankan literary prize for English writing to be awarded continuously for over two decades. Speaking at the prize event Chair of the Gratiaen Trust Prof. Walter Perera recounted the many challenges faced in sustaining a literary award in a context where funding for the arts is severely limited and Chandu Haputhanthri, Managing Director of Sarasavi – the sponsors of the Gratiaen Prize main event – outlined Sarasavi’s commitment to fostering a quality publishing culture in Sri Lanka. 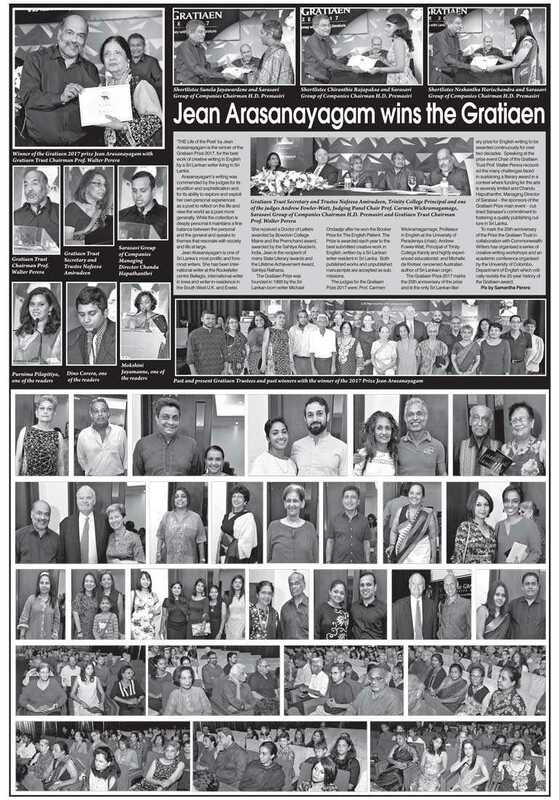 To mark the 25th anniversary of the Prize the Gratiaen Trust in collaboration with Commonwealth Writers has organised a series of creative writing workshops and an academic conference organised by the University of Colombo, Department of English which critically revisits the 25-year history of the Gratiaen award.